Construction of the n-dimensional cube. 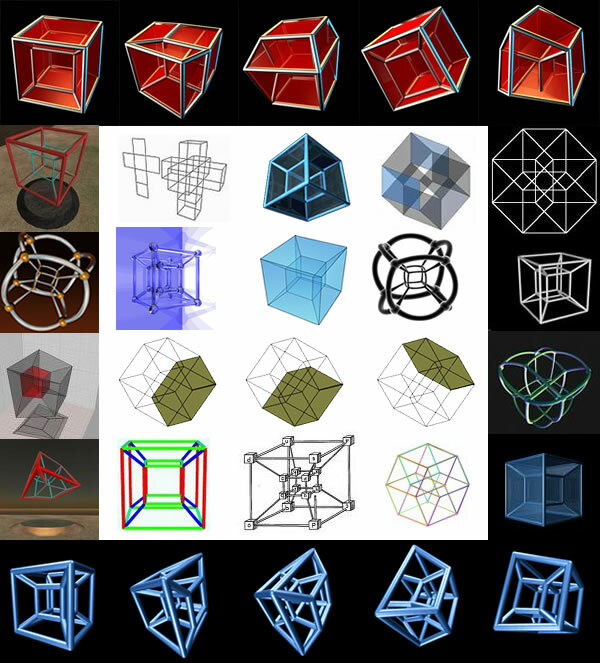 We can get an n-dimensional Hypercube from n-1 dimensional Hypercube (n> 1) with a similar construction. The construction above shows that the number of vertices is always double. The tesseract has 16 vertices. An interesting feature of the 4-dimensional cube (length of the edge is: x) is, that if we place spheres with radius x in each of the 16 vertices, we can place one more same sphere (with radius x) to the center of the 4-dimensional cube! To prove it we only need Pythagorean theorem. Calculate the the length of diagonal of n-dimensional cube! The diagonal of the 1-dimensional cube (segment) and the length of the edge is the same. The diagonal of the square is obtained by multiplying the length of the edge the square by root of 2, so the square has inside a small space if we placed the four spheres in the four vertices. Diagonal of the cube is obtained by multiplying the length of the edge of the cube by root of 3, so there is a more space inside the cube when we placed the spheres to the vertices. But we can easily to calculate there is no enough free space for the same spehere in the centre. To calculating the diagonal of the 4-dimensional cube, we have to use Pythagorean theorem onto a diagonal of a 3-dimensional cube and onto an edge perpendicular to it. So the diagonal of the 4-dimensional cube is double (2x) than the edge (x) of the 4-dimensional cube. This means that each of the 16 vertices is exactly twice as far from the center of the tesseract as the length of the edge of the tesseract. The spheres that we placed to the near vertices are tangent to each other and the sphere we placed to the center of the 4-dimensional cube is tangent to each 16 spheres that we placed to the vertices of the 4-dimensional cube.